Nothing is so devastating as the moment when you are told that your child has a life-threatening condition. Then, you start to realize that our present healthcare system is not designed to meet many of your child’s and your family’s needs. It is fragmented, impersonal, and disempowering. You feel isolated, overwhelmed, and more than a little terrified. Now, imagine a world where such families are not alone—a world where the collective healing wisdom of humanity is accessible to all, especially children thought to be incurable, and where families find strength, hope and healing through their communities. Our first initiative is to create an integrated, Web-based survival kit for families of children diagnosed with life-threatening conditions, Healing in Community™ Online, that informs, supports and enables families to harness the power of community to address all of their needs—physical, emotional, financial, social, cultural and spiritual. We have been blessed with a community of support and healing that has grown in Sophia's Garden. These gifted caregivers—family, friends, healthcare practitioners, insurance provider, related social service and public agencies, spiritual advisors and the surrounding community—have extended themselves to increase the quality of Sophia’s life. 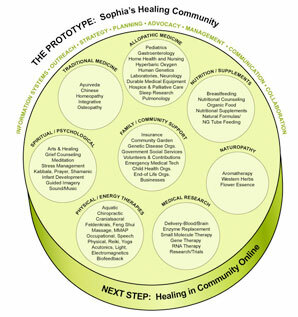 Their shared willingness to think collaboratively has revealed the power and beauty of Healing in Community™.